You don’t have to fly to the other side of the world for an epic bucket list experience; there are plenty of unbelievable opportunities right here in the United States. From wilderness trekking to flying a jetpack, I’ve come up with a list of the 5 best bucket list adventures in the US. Most I’ve tried while the others are still extremely high on my list, these experiences will get your adrenaline pumping and keep you coming back for more. Have you ever dreamed of effortless flight? Flying through the air, hovering high above the world below, even diving under water? I envisioned it since watching “My Secret Identity” as a child. It was one of my greatest bucket list dreams. Once assumed unattainable, like going to Mars, I never imaged I’d actually get to do it. Then, I heard about Jetpack America in Newport Beach, California and my dream of jetpack flight became a reality! It’s the experience of a lifetime! My 25-minute flight included real-time communication with a water jetpack instructor via a walkie talkie helmet and instructor controlled throttle for safety. I’m so addicted to the jetpack flight experience that I’m planning my next flight. Stay tuned for some cool new developments there. Maybe you can even join me! Do you live in the SoCal area? Is a jetpack flight on your list? I’m looking to make someone’s bucket list dreams a reality this year. Maybe this is the chance. Like my dreams of flight, wilderness adventure has always been high on my list but I want to experience places and sights that few are ever lucky enough to see. That’s why I’ve been scoping out Trek Alaska for the last few months. 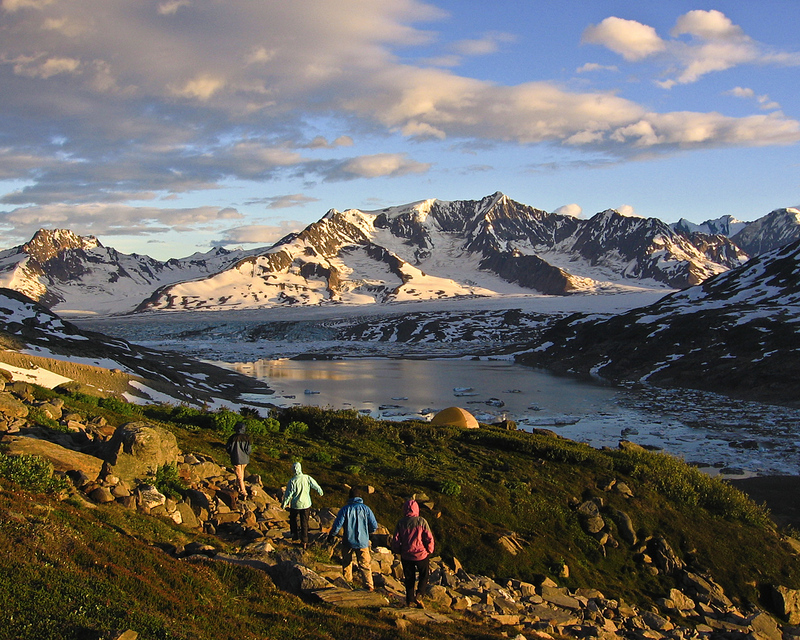 Trek Alaska provides guided backpacking adventures ranging from 3-9 days and from easier to very challenging. Most of their trips are in Alaska’s Wrangell-St. Elias National Park with treks originating our of McCarthy. They also trek in Lake Clark and Gates of the Arctic National Parks. This is one that I haven’t tried yet, but I keep looking at the unbelievable photos and reading about the experiences of owner, Greg Fensterman and I’m awe-struck. Greg is the author of Hiking Alaska’s Wrangell-St. Elias National Park published by Falcon Guides. I want to put his exelplary knowledge of the backcountry of Wrangell-St. Elias to the test. Although I’ve already visited Alaska, this adventure is putting it back on my list. With spectacular views, adrenaline, sky bridges, rappelling, and zipping, a canopy tour needed to make the list. Adventure America Zipline Canopy Tours offers authentic, full length, state-of-the art Zipline Canopy Tours at 5 different locations across the Southeast. They offer the chance to get off the ground and “fly” through the trees for a new perspective on nature and adventure. Their canopy tour locations show some of the best scenic and natural areas in the southern Appalachian Mountains. Locations include: North Georgia/Upstate South Carolina- near the famous Chattooga River in Long Creek South Carolina. Western North Carolina- in Asheville, less than 10 minutes from downtown and the Nantahala Gorge. Southeastern Tennessee– near the Ocoee River and Blue Ridge Georgia. Also in Tennessee, Pigeon River Canopy Tours near the Great Smoky Mountains National park playground of Gatlinburg/Pigeon Forge/Sevierville. Adventure America Zipline Canopy Tours is partnered with Wildwater, the Southeast’s leading guided adventure company and original white water outfitter since 1971. I’m always looking for multi-purpose travel accessories. Double-dipping in adventure seems like a logical progression. While I’m familiar with my share of extreme adventures, skydiving is the one that holds my heart like no other. I’ve jumped in numerous locations around the world but none compare to Skydive San Diego. Freefalling for approximately 1 minute, I tasted adventure like I never thought possible. My instructor deployed the parachute at about 5,000 feet and I enjoyed a 6-minute parachute flight over Southern California’s stunning scenery. Landing softly in the grassy drop zone, I wished I could fly every day. Skydive San Diego specialize in group skydives. Nothing makes a better experience than riding to altitude with a group of friends and jumping from the same plane. The bond from participating in something so extreme will last a lifetime. They are a full-service skydiving facility with multiple training buildings, deluxe packing lofts, a grass landing area, a BBQ deck and patio, and incredible scenery to match! Skydive San Diego is set up to take off and land right in the same place, where your friends can watch! I had Darren in the air with me and a good friend watching from below. My adrenaline was pumping for days. I felt like I could run all the way back to Laguna Hills! From start to finish, it was a top-notch, bucket list adventure. The Travel Channel calls the manta ray snorkel and dive “ONE OF THE TOP-TEN THINGS TO DO IN YOUR LIFETIME”. Thanks to FairWind Cruises, I was able to experience the beauty of manta rays up close and personal in an experience I will always cherish. Although you can view manta rays during daylight hours, they feed most actively at night when many plankton rise towards the surface providing one of the favorite foods on which mantas feed. Using dive lights that are safe for the manta, FairWind are able to attract these plankton which attracts the mantas. During the hour I spent in the water, several of the mantas swam so close to my body that I held my breath to avoid touching them. About half way through the experience, one manta was filling up on plankton as it danced below me. I sensed that it was getting closer than the others but I assumed it would turn before reaching me; then it happened. The manta brushed its body against my wetsuit. It was massive and its gigantic wings wrapped around the sides of my body before it turned away. I was in complete awe. It was more than an up-close encounter. I never imagined I would remain so calm but he was just gently saying hello before continuing on his way. A fear of marine life that once consumed me had disappeared and I gained a new respect and appreciation for these beautiful creatures. The more unrealistic we are with our dreams and goals, the more we are able to achieve. Go out there and get your adventure! Life is worth living. OMG that Jetpack flight looked amazing! I had no idea anyone could do that! I just moved to SoCal last week so I’ll have to check then out! I’ve done the manta dive(I lived in Kona for 2 years) – it’s amazing isn’t it? Thanks for the new bucket list item!